I attended a group of Facebook named ‘Sumi-e’. 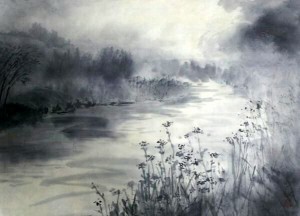 There are more than 2,700 members and we can interact with people who study ink painting. In fact, my intention was not only showing my works to people but also researching people’s favor. Of course, it is great itself to show my drawings to over 2,700 people at a time. I posted two drawings; a landscape of the riverside named ‘Spring haze’ and ‘Break of day’ that is the sea of early-morning. Both of them are my favorite but the one that had gotten overwhelming support from people was ‘Spring haze’. I got a lot of comments from all over the world. One of them was like this: “I have been there..” The river is near my house actually, but this landscape seems to be an universal mental scenery. Come to think of it, my Canadian friend and my French friend said the same thing. I understand that I should draw something like this: the common landscapes that people have a sense of nostalgia. And I will put an aura on them. That is the Sumi-e giving out an aura.